Urine is stored in the bladder until it is excreted. The urinary bladder leis within the pelvic cavity. The bladder lies behind the symphysis pubis. It is below the parietal peritoneum. Urine produced in the kidneys flows into the bladder via the ureters. The urine is ultimately excreted from the bladder through the urethra. Upon examining the histology, it can be seen that the bladder wall has the same tissue layers as the renal pelvis and ureter. The layers are: mucosa, muscularis, and serosa/adventita. The innermost portion of the urinary bladder is the mucosa. The histology of the mucosa is that is is composed of transitional epithelium and connective tissue. When looking at a histology slide of the bladder mucosa, the transitional epithelium has domed shaped cells on the apical surface. The epithelial layer contains no blood vessels or lymphatics. The basement membrane is a single layer of cells. The basement membrane separates the epithelium from the connective tissue. The epithelium lies upon connective tissue called the lamina propria. 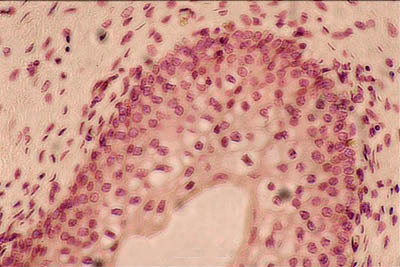 The lamina propria is composed of areolar connective tissue. It contains blood vessels, nerves, and, in some regions, glands. The urinary sites have no muscularis mucosae, and therefore, the lamina propria and the submucosa tend to merge. When examinging a histology slide of the bladder, a well delineated submucosa is not visible. Sometimes the connective tissue closest to the mucularis is called the submucosa. When looking at a histology slide of the bladder, uUnderneath the mucosa of the bladder is a layer called the muscularis. The muscularis is smooth muscle. The muscularis of the bladder is subdivided into three layers of smooth muscle: inner longitudinal, middle circlular, and outer longitudinal. Contraction of this muscle expels urine from the bladder. The smooth muscle of the bladder is called the detrusor muscle. Histology hint from Sarah Bellham: The muscle in the bladder wall is called the detrusor muscle. This is one of the few smooth muscles in the body with a name. There is a serosal covering on the upper region of the bladder. On a histology slide, it is apparent that the serosa is composed of a simple squamous epithelium overlying a small bit of connective tissue. The serosa is peritoneum. 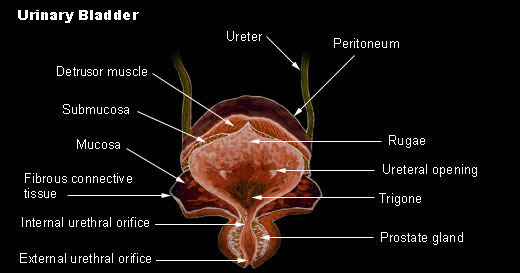 In all other regions of the bladder, the outer layer of the bladder is adventita. The adventitia is composed of connective tissue. Beyond the serosa/adventitia covering of the bladder is perivesical fat. This is a layer of fat surrounding bladder. Histology hint from Sarah Bellham: You may come across these other words to describe the histology of the bladder.